Not to be confused with World 7-6. Area 7-6 is the sixth course of Cannon Cove and the sixtieth course overall in Mario vs. Donkey Kong: Mini-Land Mayhem!. Two Mini Marios begin at the top right while the other two begin near the bottom left, with the exit door near the bottom right. In order to reach it, they must simply be guided via a series of Cannons and Blockers to it, while avoiding Snifits. The M-Token is located at the top left, in an alcove with a Blocker and a Snifit. To collect it, a Mini Mario must use the same Cannon after collecting the Mini Mario Card, firing diagonally into the alcove. 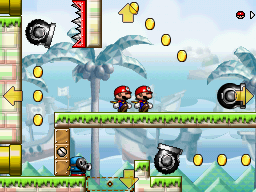 The Mini Mario Card is located near the middle right, to the right of a Blocker and to the left of a Cannon. A Mini Mario must use the Cannon while the Blocker is in place in order to reach it, which will prevent it from hitting the Spike Trap. In Plus Mode, the three Mini Marios must be guided to the exit door first, followed by the Mini Toad.